This is a sponsored post written for ZzzQuil. I was compensated for this post Vicks as part of the Vicks Ambassador Network but all opinions are my own. 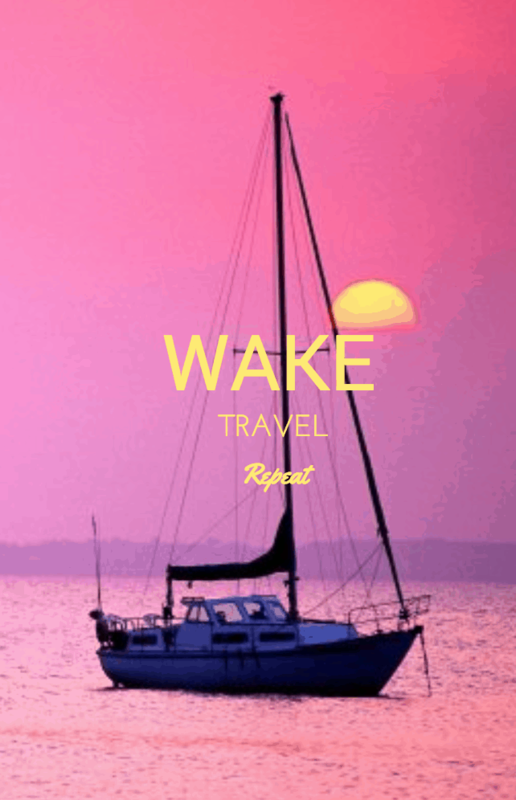 Wake. Fly. Repeat. That seems to be the way of my world as of late. And when I say “as of late”, what I actually mean is the last 6 years. That’s ok. I am actually someone who loves to explore and see new cities and lands. If there is one thing that I want to instill in my children, it’s a true affection for exploration that is why I have partnered with ZzzQuil to share my #TravelTipZzz. I’m not going to pretend that being Platinum status doesn’t come with some downfalls. After all, traveling to different time zones absolutely affects my mind, body, and soul. I’m not 21 years old anymore. Wait a minute… who said that?! Luckily, as a seasoned traveler, I’ve mastered some tips and tricks that get me through any flight pattern – whether it’s NYC to Shanghai, or LAX to Miami. Here’s a quick look at some of my must-have absolute essentials. Notebook and pen – I go old school. I like to take notes down about work deadlines, quotes from songs or movies that speak to me, t-shirt sayings, and confirmation codes. I am basically the ultimate secretary. Must document everything. And no, I don’t like to do it digitally. I need to have it on paper otherwise, it isn’t real. I have a MILLION books and they are all pretty. Sometimes I just can’t sleep when I travel– whether it’s jetlag, a hectic day or just nights away from my own bed. During those occasional times, I take ZzzQuil to help me get a good night’s sleep to wake up refreshed. ZzzQuil helps you get the sleep you need to truly enjoy your travel experience. For me, getting enough sleep is essential each and every day—it makes me feel more productive and excited for a busy day ahead. I need to stay on top of it. Those moments when I’m lying in bed wide awake are the absolute worst. On those occasional nights, I take ZzzQuil, and it helps me fall asleep easily and sleep soundly throughout the night. 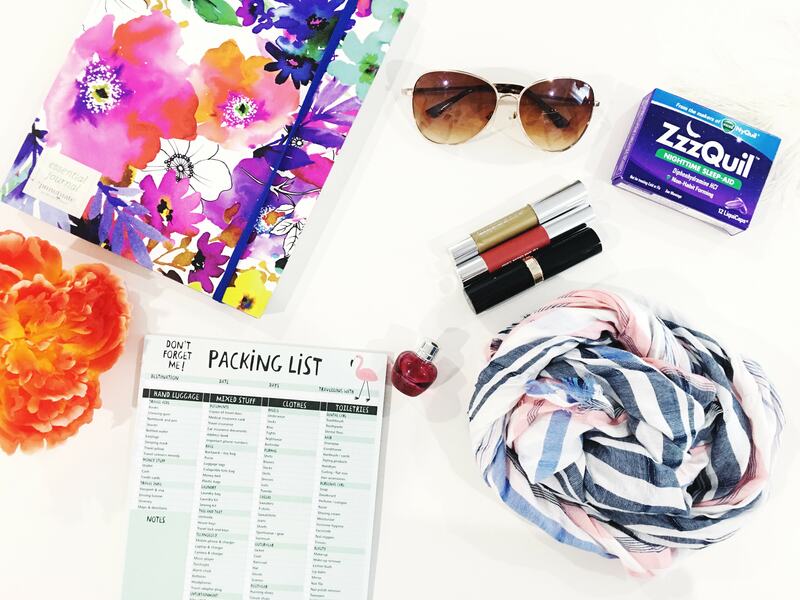 A summer scarf and sunglasses are always in my bag when I travel. I am typically always cold and need extra layers of clothing just in case there are no blankets available on the plane. Come prepared! That’s what my mother taught me. The sunglasses are to help me sleep or to pretend to sleep when someone is getting a little too chatty with me on the plane. If I need quiet time where I just want to listen to some music, the sunglasses act as a barrier between me and the rest of the world. Call me Jackie O. It’s ok. I won’t be offended. Stick makeup is my L-I-F-E. This is travel ready but honestly, this is also my everyday choice as well. That’s my whole face right there in a nut shell. One stick for my foundation, one for eye makeup and one for lip and cheek. Boom! Done. When I am home, obviously I add in a few more layers, but when I don’t have a lot of time, I can really get it all done with these three goodies. Travel-sized makeup accessories are also key. I didn’t want to add them all into the picture but think perfume, dry shampoo, make up remover, toothpaste, deodorant, and lotion. Want a pro tip? Keep everything in a travel bag and don’t use it unless you are on the go. I have doubles of everything that I love. One for home and one that is ready to be packed. This ensures I never leave the house without any of my necessities. And while some people might make fun of me, I really do have a travel check list for my family to breeze over. The last thing I need to do is forget my daily migraine medication! That would be the end of me!! It takes one second to scan through and make sure I have everything I need and it works wonders for the kids when they are packing their own suitcases with little intervention from their parents. Two years ago, I started to collect figurines from all the places I visit. As you can see, my collection is growing. I have to tell you that I literally haven’t taken a trip without ZzzQuil. That’s why I was so thrilled to partner with them to write up this post. My days are long and crazy and scheduled to then Nth degree. A proper night’s rest is a requirement – not a luxury. 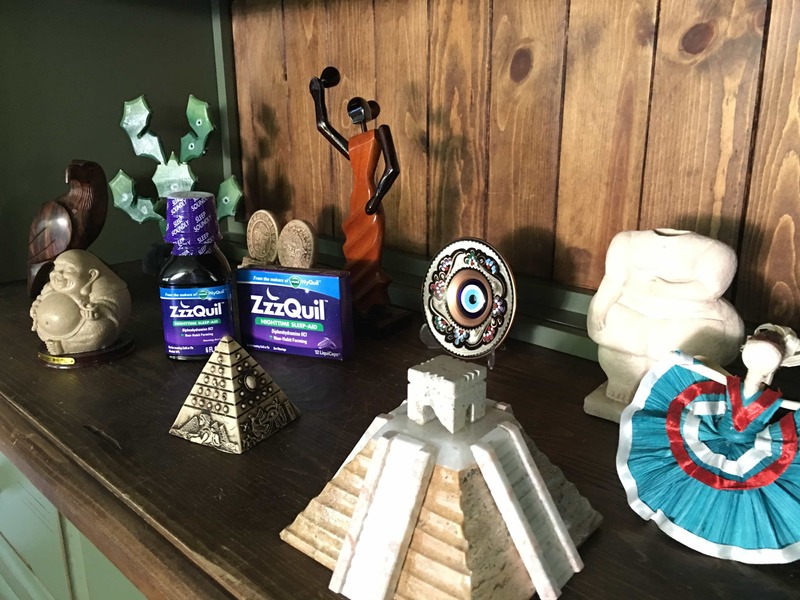 If you’d like to learn more about ZzzQuil and how it can help you on your next travel excursion, follow them on Twitter! Looking for a coupon? You are in luck! Click here to take $1 off of your next purchase!! I travel quite a bit too and I love the secrets that you share. I have a hard time sleeping on planes myself I should try this product and see if it works for me. 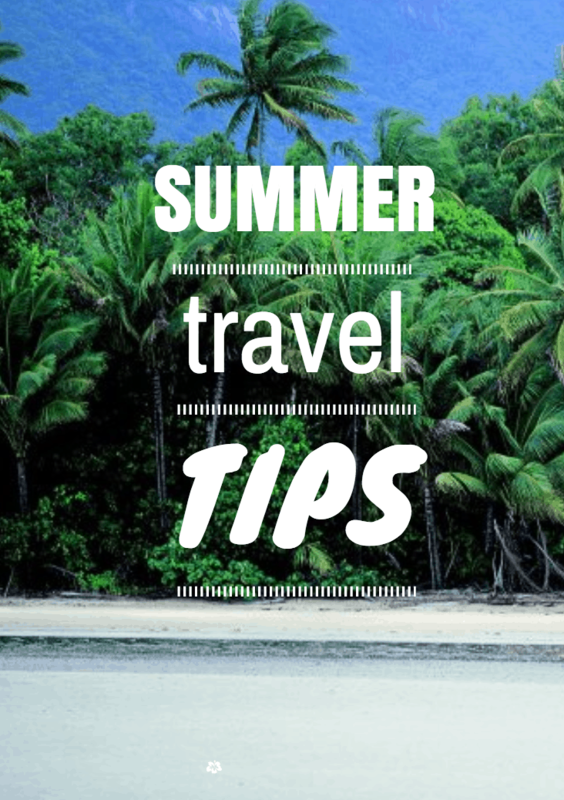 These are great tips for traveling. I hope your itinerary is full of fun.